IntroWizard Flash Website Builder 1.0 is flash tools software developed by IntroWizard Technologies. 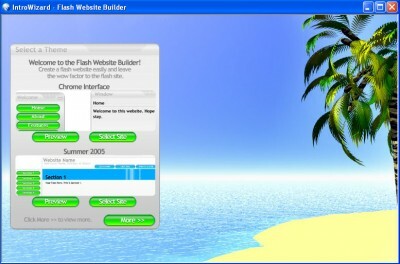 Flash Website Builder is an easy way to create your own Flash web site. Easily make your own Flash website by selecting a design and typing in your content, and clicking 'Create!' You also can create an unlimited amount of Flash websites for customers, friends, or yourself that you can sell in web design jobs and make money from! And you can still reach out to search engines with the option to have an automatically created text website too. IntroWizard Flash Website Builder 1.0 supports different languages (including English). It works with Windows 98/XP/Vista. We have tested IntroWizard Flash Website Builder 1.0 for spyware and adware modules. The software is absolutely safe to install. Our website has thoroughly tested web development product IntroWizard Flash Website Builder 1.0, written the review and uploaded installation file (3578K) to our fast server. Downloading IntroWizard Flash Website Builder 1.0 will take minute if you use fast ADSL connection.